Attorneys witness the changes in the fundraising market from a unique vantage point. Consiglieri to startup founders and investors alike, attorneys assist in the negotiation and are privy to the terms of investment. Fenwick & West, one of those law firms, released data this morning detailing the evolution of financing terms for Q4. I’ve reproduced the most salient difference in Q4 compared to previous periods above. 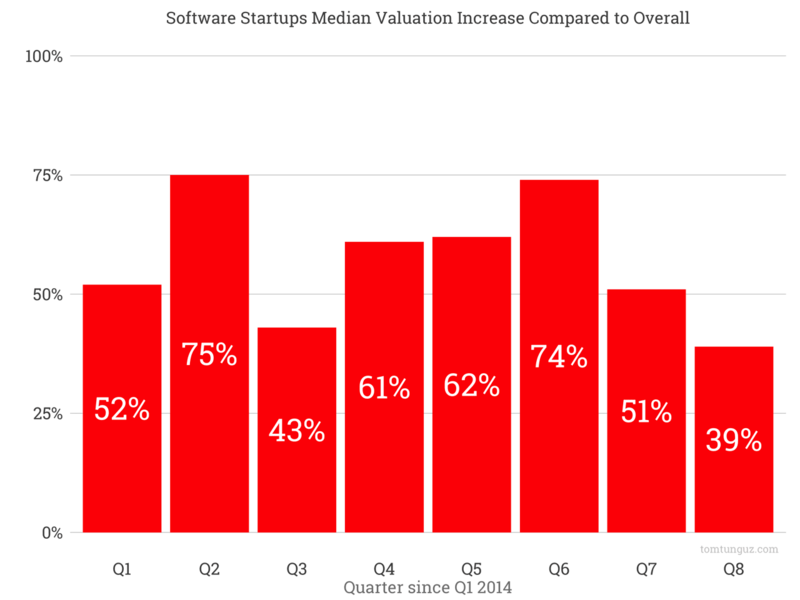 The median growth in startup valuation has fallen from a high of 74% in Q2 2016 to 39% in Q4. The difference in median valuations with such a decline is substantial. 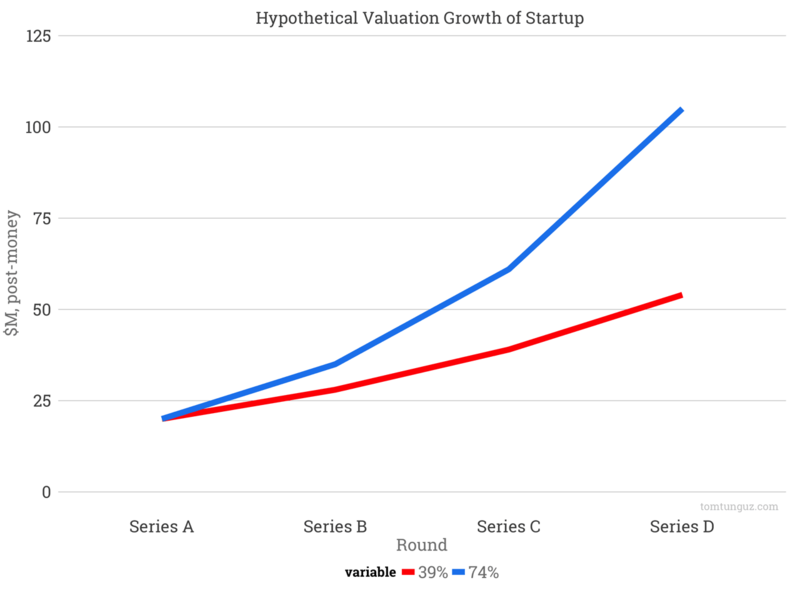 Above, I’ve plotted the valuation progression of a Series A company at $20M growing at 79% by round and 39% by round to illustrate the impact. Of course, as the first chart shows, the median increase in valuations is highly volatile, so assuming a consistent appreciation isn’t necessarily representative. We did observe a similar dip in median mark-up after the market fluttered in Q2 15, a blip that lasted just one quarter. As in the public markets, so too in the privates. 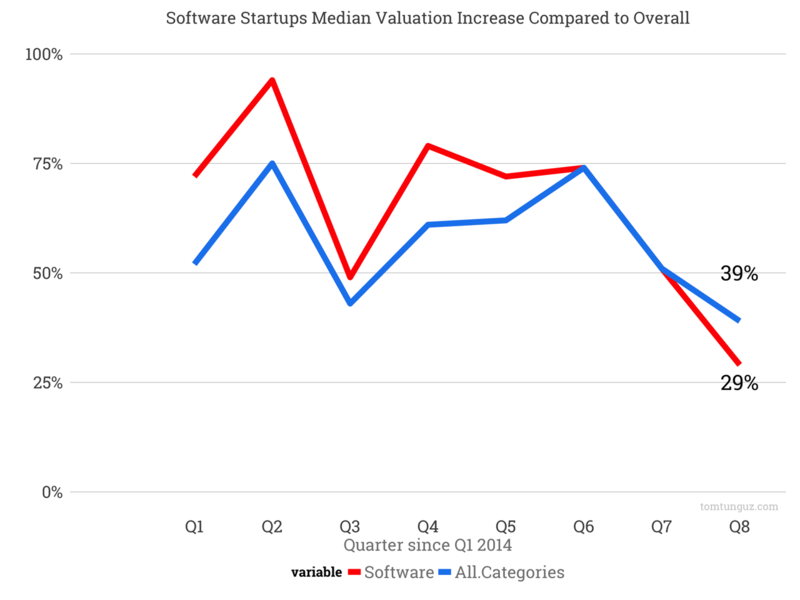 Software/SaaS companies benefitted 12-18 months ago from premium markups, often 15-20 percentage points higher. And according to Fenwick data, some subset of these startups raised rounds in Q4 at 29% increases, compared to the 39% of the venture industry as a whole. This makes sense. In the past, SaaS companies have benefitted from higher absolute prices than the rest of the venture industry. The Fenwick data shows the new season in venture capital started in Q4, earlier than the public market compression in early Q1 16. And it’s consistent with other data sets from Pitchbook and CBInsights that show a softening of the market in Q4. The rest of the Fenwick & West report details the changes in key terms of termsheets including participation, liquidation preferences, ratchets, antidilution and redemptions. These surveys are useful to understand market terms and their evolution. At this point, only the median increase in valuation has shifted substantially.